The last Tuesday of July has rolled around, and the Game Night Blog Carnival is in full swing. This blog and several others will feature board game content instead of the typical RPG/D&D fare today. 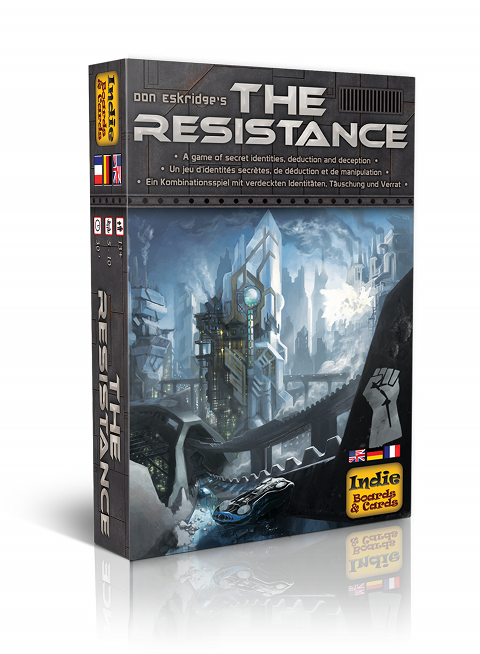 For this month’s contribution, I wanted to talk about the most unusual game I’ve played in quite some time: The Resistance. I am normally quite addicted to all the cool little bits and pieces that most board games provide. Agricola is a favorite of mine, but it’s even better with adorable vegemeeples and animeeples in place of the cubes and tokens. I love Cosmic Encounter in all its editions, most especially the recent Fantasy Flight version, but the glorious mothership and carriers from the Avalon Hill box remain my favorite. I put a lot of stock into a game’s components. The Resistance totally bucks this trend; it is a tiny box, containing a few tokens, a tiny board, and a relatively short stack of cards. It doesn’t look like much at all. It’s when the game actually starts that the real appeal of The Resistance becomes obvious. The game is set in the future, where the Rebels are fighting the evil Empire, or something like that, anyway; the story and setting are unimportant. What is important is that there are two different types of players: the good guys, and spies who are posing as good guys. 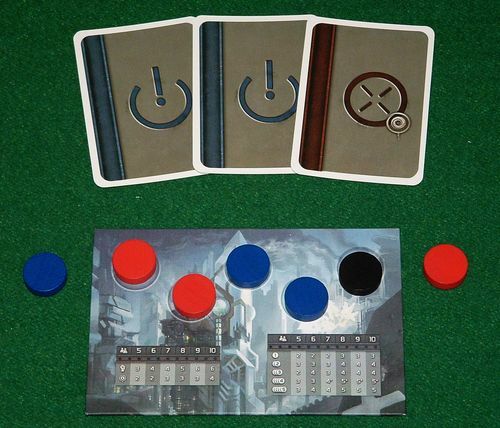 As the game starts, all players close their eyes, then the spies open and look at each other. So the spies have knowledge of one another, but the good guys are clueless. The game takes place in five stages, and in each, a team has to be chosen to complete a mission. Players take turns being the team leader, who chooses who will go on the mission. All players vote whether to approve the team selection; if a majority disapprove, the next leader picks a new team. Once a team passes the voting process, the members of that team secretly select a succeed or fail card. The team leader collects these cards and reveals them at random. If one (or two on the fourth mission) fail card is in the mix, the mission is a failure. Spies win if there are three failures, while three successful missions give the good guys the victory. This whole premise may sound simple, but I assure you that there is a level of gameplay that is quite astounding for a game you can explain in under five minutes. Information is at a premium, and the spies start with a tremendous advantage since they know each other. Every player’s vote must be analyzed; did Suzy vote yes for the mission that failed? Perhaps she is a spy! Was the first mission a success? That doesn’t necessarily mean that each member of that team wasn’t a spy; it’s often worth giving the good guys a success in order to obscure your true identity. While the base game is weighted heavily in favor of the spies, several expansion cards are included. These add additional complexities to the game and can really throw a wrench in the plans of both sides. 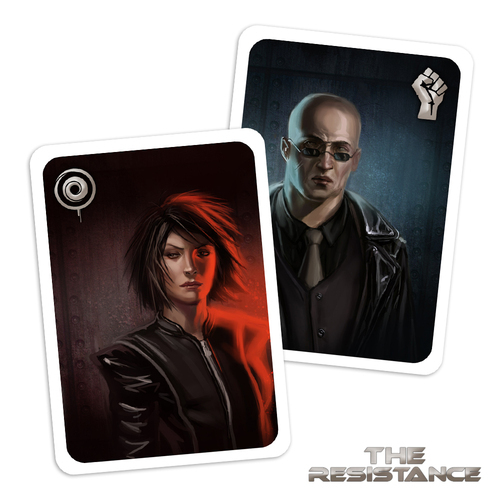 One card requires a player to reveal his or her role card (spy or good guy) to the team leader. Another nulls an approved vote. Each bit of information revealed makes things easier for the Resistance. I recently had the chance to playtest some of the next expansion’s variants. I think the strongest of these was the blind spy, who could only reveal himself to the other two spies, but couldn’t open his eyes to see who they were. It’s a simple change but it made a big impact on how things went during the game. The Resistance is one of the most elegant games I’ve ever played. It is ideal for many different gaming situations. It scales perfectly from five to ten players, and in fact is better with more people. There is no down time between turns, as everyone is involved the whole time. There is also no player elimination, unlike Werewolf or other similar games. It’s easy enough to grasp that my ten year old son could play it, yet it’s satisfying for more experienced gamers too. It would be just as fun to play after Thanksgiving dinner with your grandma as it would to wind down with your buddies after a lengthy session of D&D. I cannot recommend The Resistance enough. There is a tremendous amount of bang for your buck; the game retails for $20 and can probably be found for less if you look around. I guarantee you will have a great time when the accusations start flying and people’s poker faces are out in full force. This Resistance is definitely NOT futile!